« Sarah Palin’s wild expense accounts! Sarah Palin’s SAT Scores far below average? The Scholastic Aptitude Tests (SATs) are given yearly to high school students as part of their entrance requirements for college. 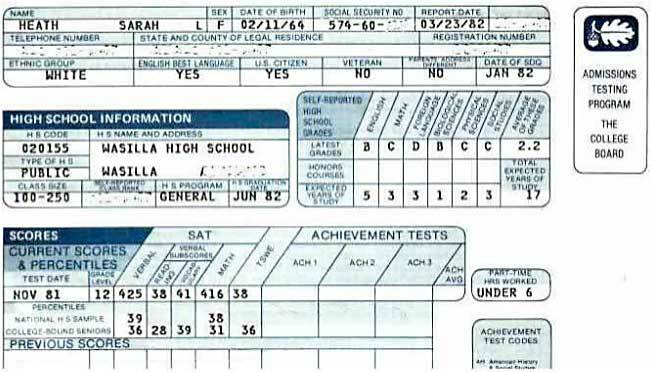 Today we received an email with Sarah Palin’s purported SAT scores. Palin took the test back in 1982, and if these are truly her scores, she is not as far below average as one might think. She ranks only in the bottom 39% of those taking the test. In 1982, the average SAT score for women entering college were 496 for verbal, and 473 for math. Palin got 425 for verbal and 416 for math. According to the report, that places her in the 39th percentile for verbal and 38th percentile for math. That means that, out of 100 students taking the SAT test, Palin did as well or better than 39% of those taking the test in verbal and 38% in math. That means that 61% did better than Palin in verbal, and 62% did better in math. Even though Palin was far below the average, she still exceeded our expectations. 4 comments to Sarah Palin’s SAT Scores far below average? Sara palin is a dumb xxxx. Period. I can’t describe this ignorant cretin moron any other way. MRD – You are most likely wrong. Dawn Eden in her blog attempts to say that the Palin SAT scores a photoshopped version of hers. This is an attempt at 15 minutes of fame by Dawn Eden. The first five digits of the social security number (the remainder are blanked out) are Palin’s. Other than Dawn Eden, there is no other reason to refute Palin’s SAT scores. Gawker.com mentions that the printed lines are not exactly straight. That proves nothing, other than it may have been printed on on old Honeywell, drum-type printer. We stick with the story – even though the results seem a bit high for Palin.